Mosey, Whinny , and Derby ignore him till they finally tell him to go to sleep. But how can a pony sleep with so many questions running through his mind? 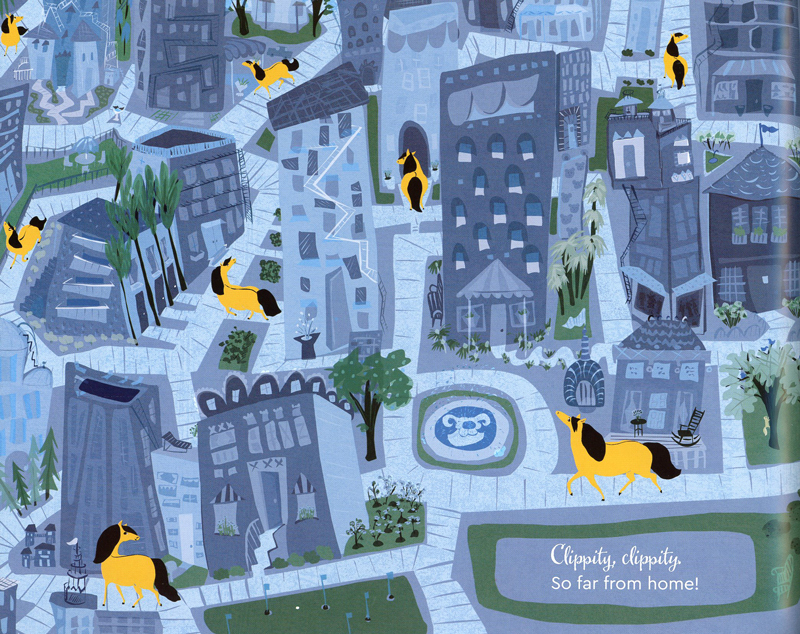 Early one morning, before the other ponies wake, Otis leaves the paddock and finds his way into the city. He wonders where they keep the children… a barn? A paddock? When he comes to a park he finds multitudes of children galloping and kicking and knickering and neighing. Very pony-like. 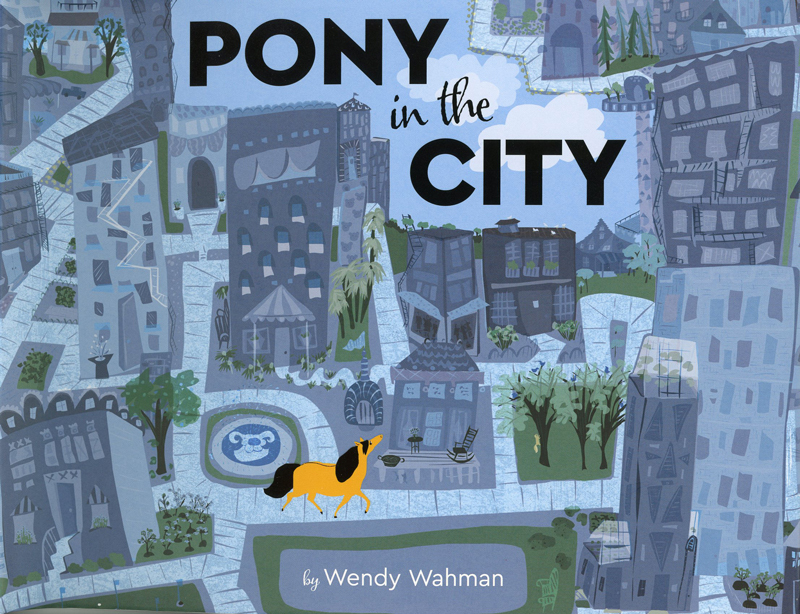 He follows some to their homes in the city and discovers children are NOT that different than ponies. Though they live in much larger barns. As night approaches, Otis realizes he is far from home and is unsure which direction to head. He wanders the city through the night escaping several close calls. And he ends up sleeping in a cold and lonely alley. He wonders if he’ll ever get home. In the morning, Otis hears a familiar clippity cloppity and is surprised to look up and find…. 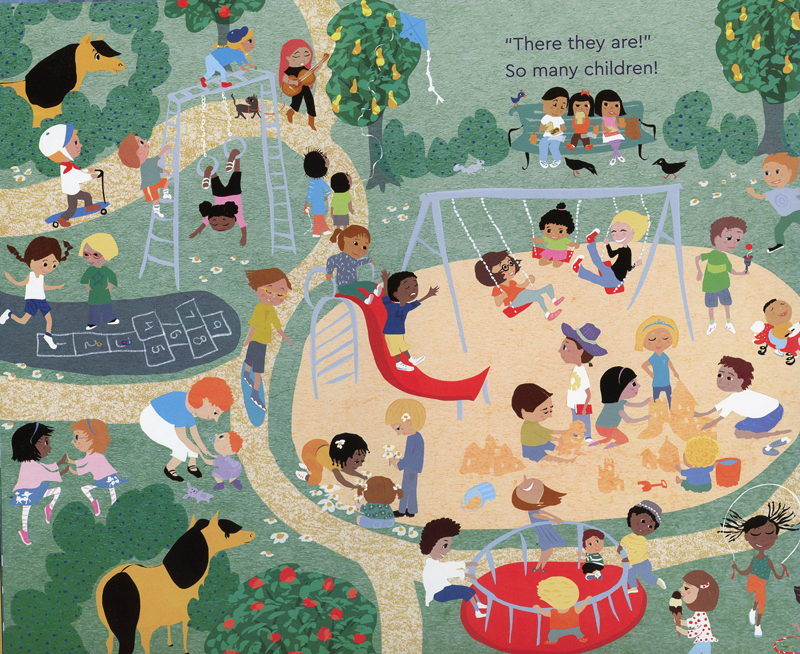 This is a charming tale about curiosity and asking questions and where it might lead one. Wahman’s unique and whimsical illustrations are bursting with detail. They are built with saturated areas of color and subtle textures. The city scenes and park scenes are mesmerizing as you scan all the life that inhabits them. In particular, for me, the blues and grays of the city at night punctuated by our orange pony searching and searching are haunting and engaging. This is a wonderful book to read over and over and discover new things in the illustrations every time. 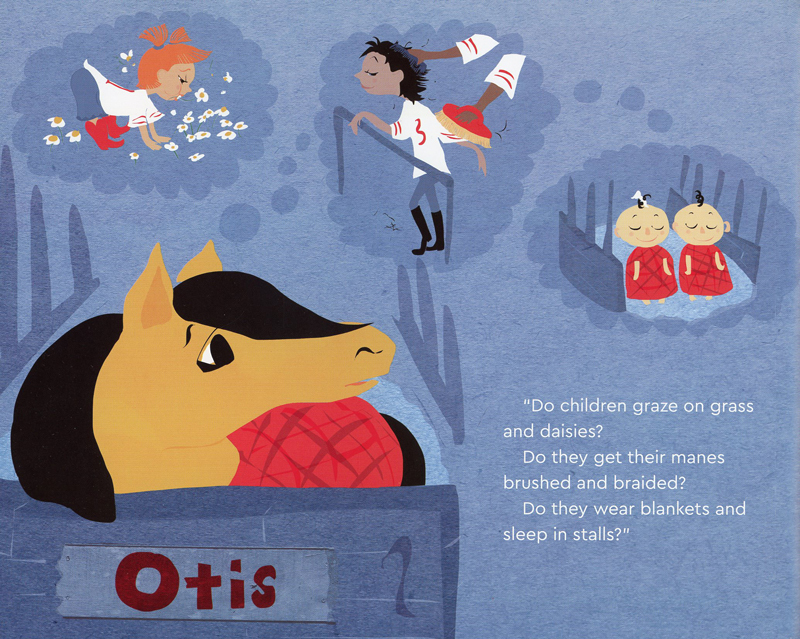 Well, Otis is one pony I want to meet! And the illustrations are so detailed! It’s charming! I love that night image, too. just think of the possibilities if I had gotten a pony for Christmas as a child! The ideas for a story would have been endless! Christmas and ponies. A nice combination! Loving these illustrations! Putting this one on my must-have list. 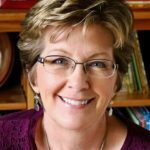 This looks great for reading over an over and encouraging questions and discussions. Cannot wait to check it out.